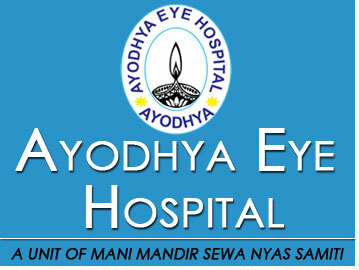 At Ayodhya Eye Hospital, we follow structured systematic protocol in all departments. Patient flow is defined very clearly; hence it is easy both for the patients and staff to do workups. There is no appointment system for outpatient visits. The patients may enter the hospital any time during working hours. The patient undergoes a comprehensive eye examination. The procedure includes dilatation and other necessary tests, which are prescribed according to the condition of the patient's eye. It may take 2 to 3 hours for a complete eye examination. If the patient requires any specialty referral he/she may require 3 to 4 hours at the hospital. Any patient who enters the hospital for the first time is called a new patient; any further visit by the same patient will be recorded as a review visit. The patient gets the information card from the enquiry counter at the entrance of the hospital, completes the card, and returns it to the new registration counter. The patient's details are entered in the computer. The patient is charged Rs. 30 as a consultation fee, payable at the new registration counter. If patient is not able to pay Rs. 30 as registration fee he/she is examined Free of Cost. The consultation fee is valid for 15 days from the day of last payment, within which time number of visits can be made without any further consultation fee. After 15 days, the patients will have to pay the consultation fee again. The patient is provided with an "identification card." This card records the medical record number, date of first visit, and the patient's name and address. The patients must bring their ID card each time they visit the hospital. The patient record (case sheet) is created when the patient registers at the counter. The patient's medical record is retained at the hospital. The patient is sent with his case sheet for preliminary vision testing. After the preliminary vision test, the patient is escorted to the examination area. Finally, the doctor examines the patient. If the doctor suspects that the patient has any complication, the patient is sent to reference hospitals. If the patient has refractive error he is given a prescription for glasses or medicine. If the patient has cataract he is sent to the counseling department with advise for surgery. The patient can clarify doubts regarding the surgery, facilities and charges. The patients willing for surgery are directed to the admission counter. Patients can reserve a date for surgery in the counseling department on any date that is convenient for them. Patients must bring their OPD Sheet or Discharge sheet, which was provided to them during their first visit, to the hospital. Patients must register at the registration counter. The patients will be asked to wait in the reception area. As soon as the case sheet is retrieved, the patients will be called by the public announcement system and escorted to the units as recorded in the case sheet. The other outpatient procedures for review patients are similar to those for new outpatients. The date of surgery is confirmed according to the patient's convenience. The patient may also decide, after consultation with the doctor, how long the postoperative stay should be. The length varies according to the surgery condition of the patient. When the patient is willing to undergo surgery, patient is counseled in the general counseling department. The patient is then directed to the admission counter where the full charge must be paid in advance. The patient gives consent for surgery at the time of admission. The inpatient record, continuation sheet and operation notes are attached to the patient's case sheet. The patient is assigned a bed at the admission counter. The patient is sent to the Pre Surgical unit along with case sheet. After surgery, Counselor provide postoperative counselling. Discharge summary is given to the patient at the time of discharge. 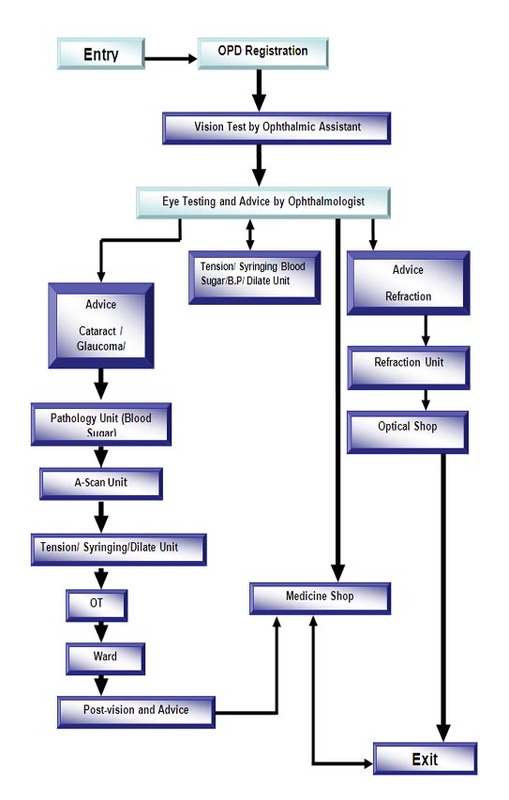 Review date is assigned for follow-up of the eye condition.